Hakuna Matata invites you to experience the ultimate in exclusivity at a country estate with a difference. Hakunamatata which means 'no problems' is a private estate framed by rolling hills and luxuriant sub-tropical vegetation. Hakunamatata invites guests to experience the ultimate in exclusivity at a country estate with a difference. Imagine water features, fragrant flowers and indigenous birds fluttering everywhere and you'll know what to expect at Hakunamatata. The spacious 'Kayas' designed around the streams and ponds convey a sense of enchantment and luxury by blending African aesthetics with imaginative architecture. The cottages are fully self-catering and equipped with telephone and TV, while fax and e-mail are also available. Meals can be arranged. Facilities on the premises include swimming pool and sauna, Health Spa and beauty care. Rustic elements include African prints, recycled glass, wrought iron, thatch and carved wood. Restaurants, shopping areas, golf courses and game parks are nearby. 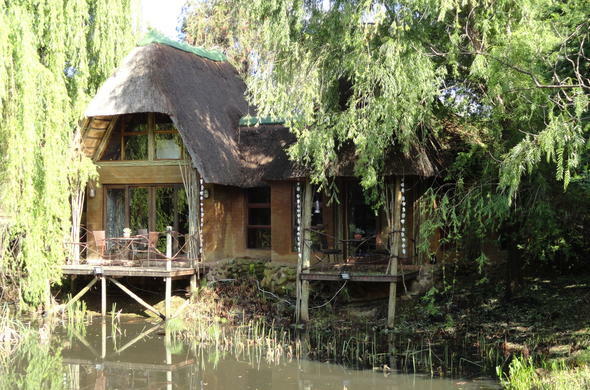 Hakunamatata is only 30 minutes from Johannesburg and Pretoria CBD.